Daniel Ricciardo brought back memories of Formula One great Michael Schumacher in his prime on Sunday as the Australian nursed a wounded Red Bull to Monaco Grand Prix victory in the team’s 250th race. Winning from pole position for the first time in his career, Ricciardo drove for nearly two thirds of the race with a car down on power due to problems that emerged on lap 28. Ferrari’s Sebastian Vettel, last year’s race winner, finished second to cut Lewis Hamilton’s overall lead to 14 points after six of 21 rounds. “You have done an amazing job today,” team boss Christian Horner said after Ricciardo took the chequered flag 7.3 seconds clear of Vettel. Ricciardo’s only previous pole had been in Monaco two years ago, when he lost out to Hamilton on strategy and finished runner-up. 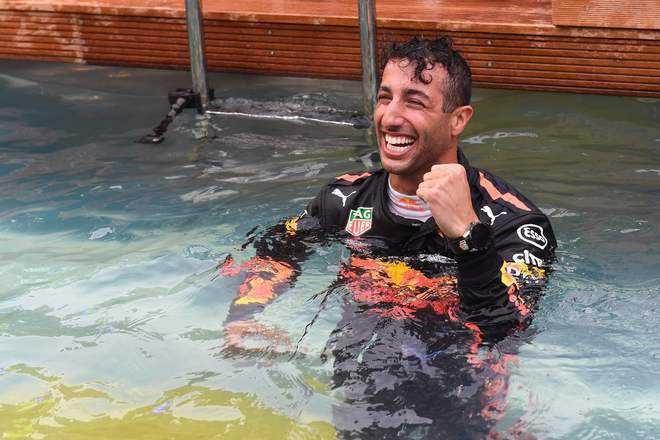 This time Ricciardo also made a clean start and, controlling the pace and the race, looked as much of a nailed-on certainty for victory as ever exists on Monaco’s treacherous metal-fenced streets. And then it all seemed to unravel when he reported a loss of power over the team radio. “OK mate, we can see what’s going on,” his race engineer replied after a pause. “You just need to keep it smooth, keep focused.” “Will it get better?” enquired the Australian. “Negative,” came the reply.